Following Anthony Bourdain’s recent passing, I felt compelled to create something new. Paying homage to a great individual through abstract portraiture was my primary goal. I learned a lot of new things about the world from watching Tony’s shows. This included not only new culinary traditions. Bourdain opened people’s minds up to what life is like for other individuals around the world. He did more to teach people about their own lives than most teachers, ministers, or politicans. All he had to do was walk into a market, restaurant, jungle, or rural area. He didn’t shy away from his opinion or perspective, but he never criticized anyone based on any factor they had no control over. He dealt with presenting poverty in a wide range of manners. Sometimes his optimism was present, sometimes it wasn’t. He even went into active war zones and hostile territories for the sake of finding a new way to put a human face on the situation. To me, that is what distinguished him as a personality and a human being. Bourdain’s mission always seemed to want to bring people together through a common conversation. Usually over a bowl of noodles. He even arranged for the first major visit of a U.S. president in Vietnam since the Vietnam War. That moment being one of the most poignant in his career. The table where he ate noodles with President Barack Obama still sits as monument in that small restaurant where they commiserated over the future trajectory of the world. Anthony Bourdain brought people together in my life. Me and my mother often bonded over watching his shows and exploring new corners of the world. My friend Rob traveled the world, and eventually met his wife because of Bourdain’s influence. This was often reflected in Bourdain’s presentation of family meals and home cooked food, of which he had a particular fondness. I set out to create this painting with a certain tone and color pallet in mind. That is to say I had a general idea of where I was going with my approach to color and light. At times I did struggle with where my use of color was going. At times the colors in his face made him look somewhat dead. While it was certainly the case, I set out to create what is ultimately a positive interpretation of the subject. This is the first time in many years oil paint has played a role in my mixed media process. I got some excellent subtle tones and resolved the issues I was concerned with. Ultimately I was able to humanize him to great effect. I noticed a difference between the experience that brought me to the conclusion of this painting, and how it was perceived. I sought to really bring a positive light to the subject matter. Bourdain’s passing was very sudden, and came to a surprise to a lot of people. During one group discussion, I got a comment from a fellow colleague regarding the color scheme. My friend Jacqui asked me why I chose such a color scheme for such a “worldly individual.” It’s true that I definitely created this painting in a way that mythologized the man. Given that I never knew him beyond the context of the show, it’s hard not to do this. It’s a fair question as well. Given that I was seeking to reconcile my own feelings regarding the events surrounding the subject, and the reality of the situation, I feel a little bit of artistic license is fine. Just how much difference was there between the public individual and the one we saw on Television? Don’t get me wrong, I can easily see how Bourdain would want to keep his private and professional life separate. It makes total sense. I still think there was a real genuine nature about him that always came through. He was honest, giving, and had a great empathy for human beings. These qualities seemed to become more prominent as time progressed. There was still something unique about what I captured. The personality was both human, but slightly confrontational. You could see a lot of wisdom, but a warm generous soul as well. Iconography and incorporation of map rendering. I included some iconography and map rendering in this painting. The icons are relevant to Bourdain’s life and career. Knives, sushi, and pork are playfully referenced in the piece. The dove in the bottom to me is a symbol of Bourdain’s efforts to build a connection with a world that encourages peaceful discourse. The globe is referenced in the painting twice. once forward, once backward.this is intended as a reference to how our world currently exists in different “versions” of reality. I believe Tony did his best to reconcile this by telling really intimate stories of every day life. 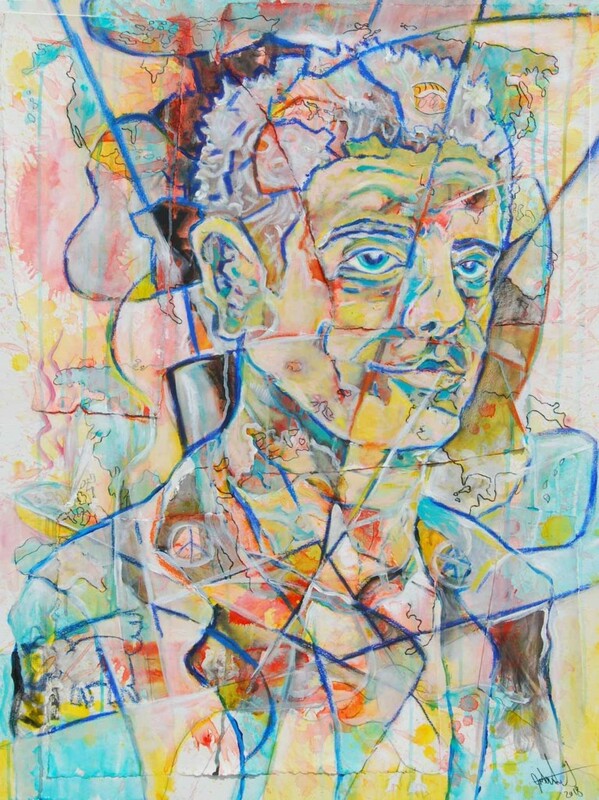 One comment I got from people was that Anthony’s “fractured psyche” showed through in the painting. This wasn’t necessarily intentional. However, I feel it would be remiss of me to alter the painting to such a degree that this gets lost. Part of how this came about, as I have previously mentioned, had to do with my subconscious desire to reconcile my own level of grief regarding this individuals passing. I definitely never had any desire to make light of the event at any time. There’s both a sense of calm, but a slight, subtle hint of tension that comes through in the painting. With all this being said I want to mention a couple of organizations I feel can help people struggling with mental health, as Bourdain did. Foundation 49 – A Dallas, TX based organization helps young artists and musicians deal with depression. This organization is doing great work to help save lives. Please check them out and support their organization. Nuchi’s Space – is an Athens, GA based organization that has a similar goal in mind, and provides a space for musicians and assistance for those struggling with mental health. They are also very deserving of support in their mission. With organizations like these, we can hopefully see more beautiful individuals like Anthony thriving and making a huge difference in the world as he did. Order a custom gliche from Saatchi!